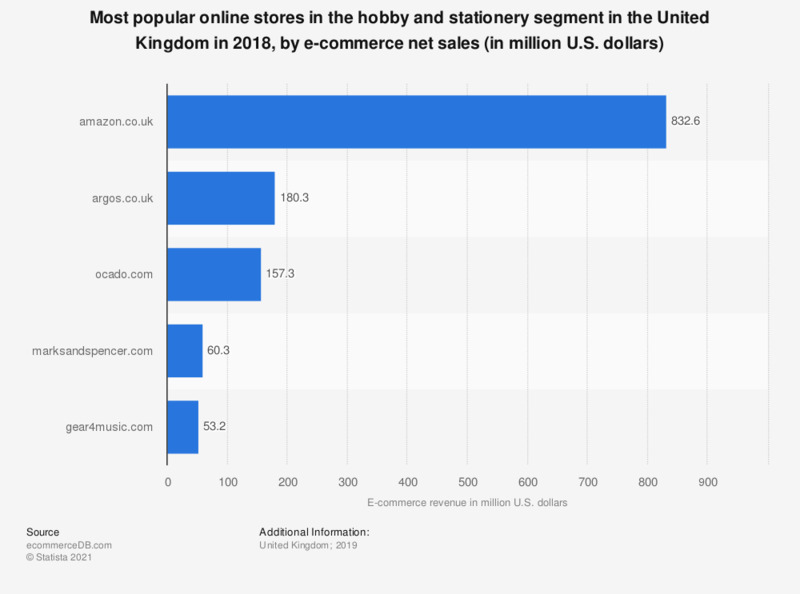 This statistic presents a ranking of the most popular online stores in the United Kingdom in the hobby and stationery segment in 2018, sorted by annual net e-commerce sales. For more information please visit ecommerceDB.com. In 2018, market leader amazon.co.uk generated 655,5 million U.S. dollars via the sale of products from the hobby and stationary segment in the United Kingdom. The online store argos.co.uk was ranked second with a revenue of 180,3 million U.S. dollars. The e-commerce market category “Hobby & Stationery” contains the online sale of hobby items and Stationery goods. Musical instruments, photo and printing needs, office equipment, pens & paper, collectors’ pieces (including art and antiques) and adult entertainment products are included in this category. Hobby-related products already found in the “Sports & Outdoor” and “DIY, Garden & Pets” market categories are not included. The e-commerce market encompasses the sale of physical goods via a digital channel to a private end user (B2C). Incorporated in this definition are purchases via desktop computer (including notebooks and laptops) as well as purchases via mobile devices such as smartphones and tablets. The following are not included in the e-commerce market: digitally distributed services (e.g. travel tickets), online stores dedicated to digital media downloads or streams as well as online stores dedicated to B2B markets nor sales between private persons (C2C). Market volume, market growth and all monetary figures at store level refer to the annual e-commerce net sales after the deduction of returns. For more information please visit our methodology page on ecommerceDB.com. Statistics on "Online shopping in the United Kingdom (UK)"
How do you learn about products or offers online? Did you check the product physically before purchase? Which products do you prefer to see physically before purchasing? Did your business experience growth of e-commerce sales in the past year?